The JSE closed higher on Tuesday as the big jump in Asian counters inspired a rebound in global stocks. Chinese stocks shrugged off the prevailing trade war concerns which saw the Shanghai Composite Index jump 2.92% as investors turned bullish on the prospects of increased government spending. In Hong Kong, the main benchmark rose 1.54% while the Nikkei firmed by 0.69%. European counters rode the wave as they also inched higher on the day. Locally, there was some disappointment with the slow increase recorded in manufacturing production for the month of June. YoY Manufacturing Production only increased by 0.7% which missed the forecasted increase of 2.2%. MoM Manufacturing Production only increased by 0.3% following a prior increase of 1.5%. The rand did not react negatively to the data as the weaker US dollar gave it an impetus to strengthen. The rand reached a session high of R13.27/$ before retracing marginally to trade at R13.31/$ at 17.00 CAT. On the JSE, blue-chip counters led the gains with diversified miner Anglo American PLC [JSE:AGL] picking up 3.13% to end the day at R300.20 per share. Industry peer, BHP Billiton gained 2.22% which saw the stock close at R299.58. Investment holding firm, Remgro [JSE:REM] added 3.6% to close at R213.63, while Netcare [JSE:NTC] firmed to R27.97 after adding 2.76%. 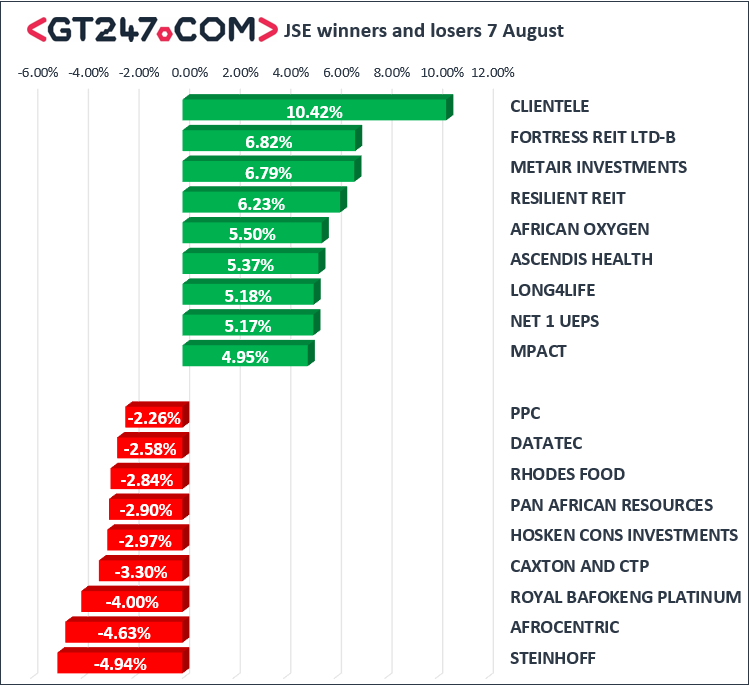 Listed property stocks, Resilient [JSE:RES] and Fortress B [JSE:FFB] were among the day’s biggest movers after gaining 6.23% and 6.82%, to close at R54.60 and R15.50 per share respectively. Long4Life [JSE:L4L] recouped some of Monday’s losses to end the day up 5.18% at R5.08 per share. Sugar producer, Tongaat Hulett [JSE:TON] climbed 4.06% to close at R86.66, while Dis-Chem [JSE:DCP] closed at R30.44 per share after adding 3.15%. Steinhoff International [JSE:SNH] slipped to close at R2.31 after losing 4.94%, and Royal Bafokeng Platinum [JSE:RBP] lost another 4% which saw the stock close at R24.00 per share. RCL Foods [JSE:RCL] eased to R16.64 per share after shedding 2.12%, and cement producer, PPC Limited [JSE:PPC] closed 2.26% weaker at R6.61 per share. On the Top-40 index, Nedbank [JSE:NED] closed 1.61% softer at R260.14 per share despite releasing a relatively decent set of half-year results. The JSE Top-40 index eventually closed the day up 1.56% while the JSE All-Share index managed to add 1.49%. All the major indices managed to close in the green with the Resources index benefitting the most after adding 1.88%. The Industrials index firmed by 1.76% while the Financials index added 0.58%. Gold rallied on the back of the weaker US dollar to reach a session high of $1216.23/Oz. At 17.00 CAT, it had retraced to trade at $1211.47/Oz. Platinum was up 0.98% to trade at $830.90/Oz, while Palladium was 0.83% firmer to trade at $915.87/Oz. Brent crude continued to rally following the news about Saudi Arabia’s potential intervention to increase oil supply. The commodity rallied to a session high of $74.90/barrel before retracing to trade at $74.49/barrel just after the JSE close. Bitcoin traded firmer on the day and at 17.00 CAT it was up 1.64% to trade at $7090.70/coin, and Ethereum was only 0.27% firmer to trade at $408.37/coin.